Holland America Line, which runs cruises to The Bahamas and the Caribbean region, recently completed the addition of the line's casual Italian restaurant Canaletto and transformed the Lido Terrace into an enclosed Wintergarden aboard ms Prinsendam during its dry-dock in Freeport. SEATTLE, Jan. 16, 2013 /PRNewswire/ — Holland America Line recently completed the addition of the line’s casual Italian restaurant Canaletto and transformed the Lido Terrace into an enclosed Wintergarden aboard ms Prinsendam. Named for the famous 18th-century Venetian artist, the award-winning Canaletto is located in the Wintergarden, which is adjacent to the Lido dining area. The restaurant serves classic Italian fare with tableside service for dinner only, and reservations are encouraged. 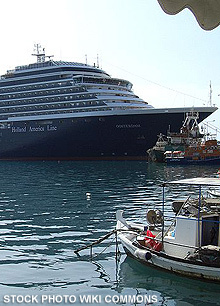 With the addition of the eatery to Prinsendam, Canaletto is now on all 15 ships in the Holland America Line fleet.